The Final Match of Amity Polo Cup 2016 (8 Goals) was played between Sona Polo and Jindal Panther at Jaipur Polo Grounds, New Delhi, which witnessed some of the finest moves by the players and their equestrians. 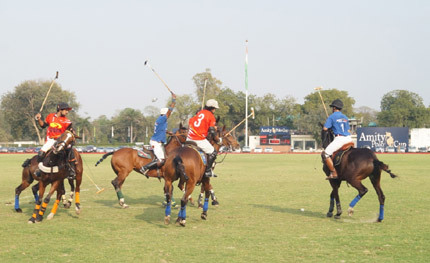 The glistening Trophy was lifted by Jindal Panther which edged out Sona Polo by 5 ½ goals to 3. Miguel Saravia and Rehat Virk scored one goal each for Jindal Panthers which started with ½ goal on Handicap whereas Vishal Singh scored 3 goals for Sona Polo. Amity Polo Cup Trophy was presented by Dr Ashok K. Chauhan, Founder President, Amity Group, Dr (Mrs.) Amita Chauhan- Chairperson, Amity Humanity Foundation and Amity International Schools; Dr Atul Chauhan-Chancellor, Amity University, Mrs Pooja Chauhan- Vice Chairperson, Amity Humanity Foundation and other senior members of the Management. Speaking during the occasion, Dr Ashok K. Chauhan applauded the exemplary sportsmanship and teamwork displayed by the players and assured that in future, Amity Group will organize more such events to nurture in Amity students a sense of social responsibility and to support the underprivileged sections of the society for assimilating them into mainstream. Radiating joy and contentment, Ms Pooja Chauhan remarked that education is a great enabler and an empowering instrument. It is very important to reach out to the marginalized sections of the society and empower them to shoulder the responsibility of the country. Talking about project AMITASHA and ATULASHA and how hundreds of underprivileged boys and girls are nurtured under these projects, Mrs. Chauhan, further, said that Amitasha and Atulasha aim to provide fillip to the underprivileged children by providing them free of cost education in an unbiased and non- discriminative manner. The glitterati present during the finals included numerous Diplomats and Socialites such as Shri Amar Singh- Politician, Shahnaz Husain -CEO of Shahnaz Herbals Inc and Ambassadors of Poland, Malta, Korea, Syria, Lisotho, Slovania, Iraq and Israel.